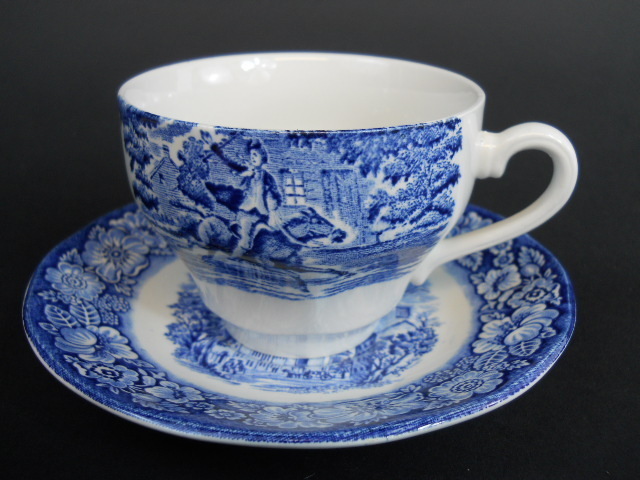 Liberty Blue English Staffordshire Blue White Paul Revere Coffee Cup and Saucer For your consideration is this Beautiful Blue and White English Staffordshire featuring Betsy Ross from the Liberty Blue Blue Collection. The Coffee Cup and Saucer is in Excellent Condition. No Chips, Cracks or Paint Loss. The Finish is Shiny and Bright. 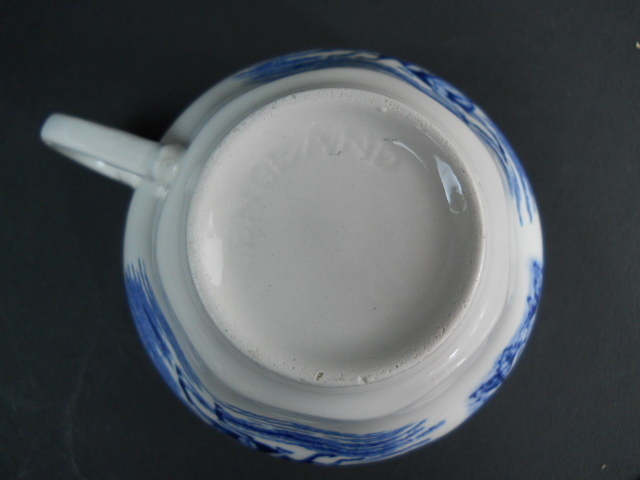 No or Minimal Scratches or Visible Utensil Marks. This is a Vintage Discontinued Pattern made from 1975 thru 1981. The Coffee Cups measures 4" long x 3 1/2" in Diameter x 2 3/4 high overall. 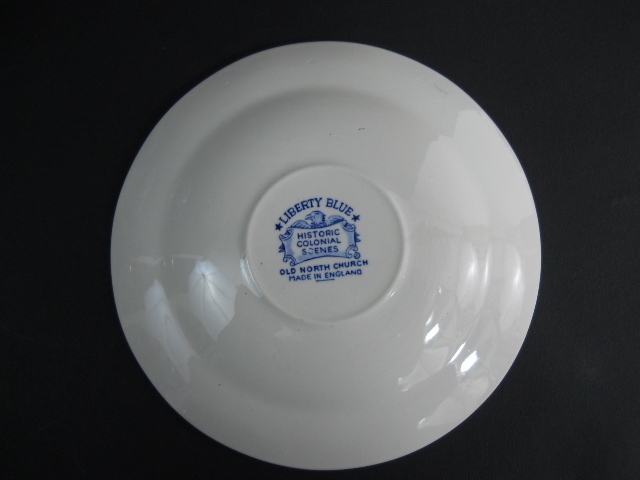 The Saucer measures 5 5/8" in Diameter overall. 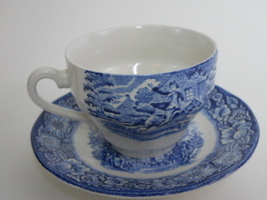 Please see our other listings for more items in this Beautiful Pattern. 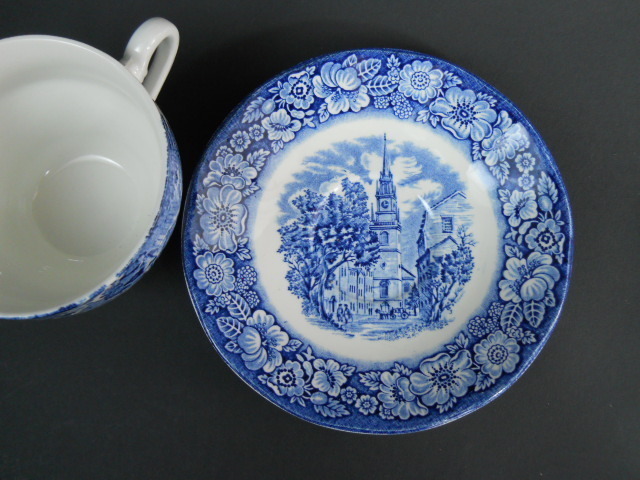 We have a complete set as of this listing of Serving Pieces and Dinnerware. We are always please to combine shipping to save you on Shipping costs. Thanks! 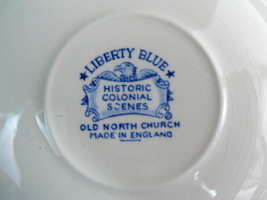 Visit My Store: Barn and Stone House Collectibles Please email for more info or photos. We will gladly combine shipping when safety allows. Please contact for a quote. International Bidders Please Note: •I will fill out a customs form for every shipment sent out of United States. The declared value will be the amount you paid for the item. You are responsible for any duties or customs fees. •Import duties, taxes and charges are not included in the item price or shipping charges. These charges are the buyer's responsibility. •Please confirm with your country's customs office to determine what these additional costs will be prior to bidding/buying. Your Satisfaction is my Goal. I will strive for 5 stars ratings. If you feel that you did not receive 5 stars service in any category, please contact me before leaving feedback and we will remedy the situation in a professional manner. Thank you ! Thanks for looking! Professional 3rd Party Shipping Insurance provided by: Please see our return policy for info. Thanks. 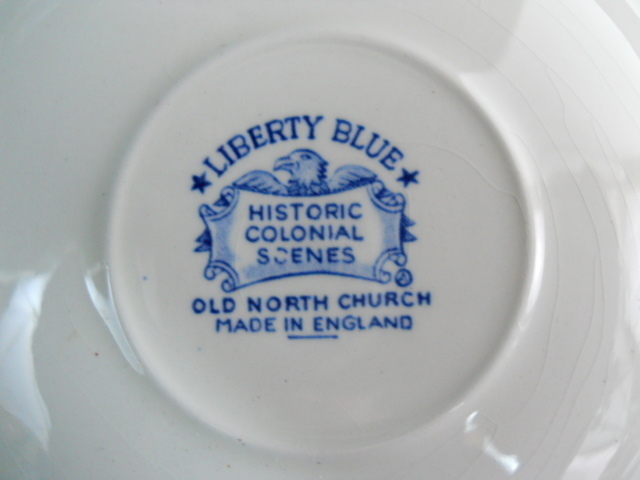 Liberty Blue English Staffordshire Blue White Paul Revere and Old North Church Coffee Cup and Saucer _gsrx_vers_486 (GS 6.5.1 (486)) On Feb-23-13 at 15:19:36 PST, seller added the following information: Every buyer gets a MyStoreRewards invitation for cash back On Feb-24-13 at 00:54:58 PST, seller added the following information: FREE! Sellers: Add a FREE map to your listings. FREE!